Definition at line 64 of file llfloaterimport.h. Definition at line 93 of file llfloaterimport.h. Definition at line 80 of file llfloaterimport.cpp. References gDirUtilp, LLDir::getDirDelimiter(), mFilename, mFilenameAndPath, mFilePath, mObjectFile, NULL, and LLXMLNode::parseFile(). Definition at line 351 of file llfloaterimport.cpp. Definition at line 516 of file llfloaterimport.cpp. References LLUUID::asString(), LLAssetType::AT_NONE, ImportAssetInfo::Desc, finishImport(), ImportAssetInfo::ImageFileQueue, LLInventoryType::IT_NONE, llendl, llinfos, LLResourceData::mAssetInfo, LLUploadDialog::modalUploadFinished(), LLResourceData::mUserData, LLAssetInfo::mUuid, ImportAssetInfo::Name, ImportAssetInfo::NewImageIDList, LLStringBase< char >::null, PERM_NONE, and upload_new_resource(). Definition at line 394 of file llfloaterimport.cpp. References LLImageGL::bindExternalTexture(), LLPanel::childGetRect(), LLFloater::draw(), f, format, gl_rect_2d_checkerboard(), glBegin, glEnd, LLRectBase< Type >::mBottom, mCurrentPreviewImage, mGLName, LLRectBase< Type >::mLeft, LLRectBase< Type >::mRight, LLRectBase< Type >::mTop, LLPointer< Type >::notNull(), stop_glerror, and LLImageGL::unbindTexture(). Definition at line 457 of file llfloaterimport.cpp. Referenced by asset_uploaded_callback(), and onBtnOK(). Definition at line 611 of file llfloaterimport.cpp. References LLScrollListCtrl::getAllSelected(), LLScrollListItem::getColumn(), LLScrollListCtrl::getLastSelectedItem(), LLScrollListCell::getText(), LLScrollListItem::getUUID(), LLFloater::handleMouseDown(), LLUUID::isNull(), mCurrentPreviewImage, mGLName, mImageLabel, mImportList, mPreviewImages, LLUUID::notNull(), NULL, recalcCost(), LLUUID::setNull(), and LLTextBox::setText(). Definition at line 321 of file llfloaterimport.cpp. Definition at line 601 of file llfloaterimport.cpp. Definition at line 544 of file llfloaterimport.cpp. 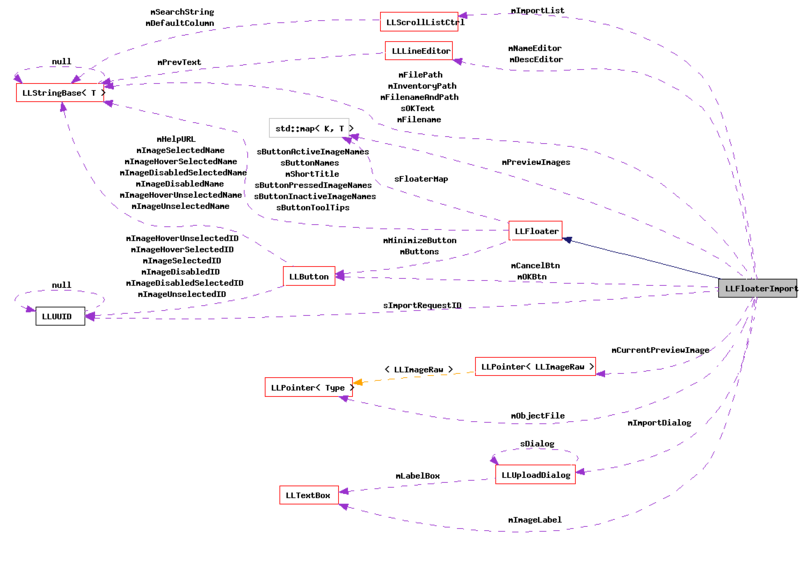 References asset_uploaded_callback(), LLAssetType::AT_NONE, LLFloater::close(), ImportAssetInfo::Desc, ImportAssetInfo::FilenameAndPath, finishImport(), gDirUtilp, LLScrollListCtrl::getAllSelected(), LLDir::getDirDelimiter(), LLLineEditor::getText(), ImportAssetInfo::ImageFileQueue, LLInventoryType::IT_NONE, llendl, llinfos, mDescEditor, mFilenameAndPath, mImportList, mInventoryPath, mNameEditor, ImportAssetInfo::Name, LLStringBase< char >::null, ImportAssetInfo::OldImageIDList, PERM_NONE, ImportAssetInfo::SourcePath, and upload_new_resource(). Definition at line 102 of file llfloaterimport.cpp. References ADD_BOTTOM, LLScrollListCtrl::addElement(), LLScrollListCtrl::addSimpleItem(), DB_INV_ITEM_DESC_STR_LEN, DB_INV_ITEM_NAME_STR_LEN, FALSE, LLFile::fopen(), gDirUtilp, LLUICtrlFactory::getButtonByName(), LLDir::getDirDelimiter(), LLRectBase< Type >::getHeight(), LLUICtrlFactory::getLineEditorByName(), LLView::getRect(), LLViewerWindow::getRootView(), LLUICtrlFactory::getScrollListByName(), LLUICtrlFactory::getTextBoxByName(), LLRectBase< Type >::getWidth(), gViewerWindow, LLMD5::hex_digest(), llendl, llinfos, llmin(), LoadPreviewImage(), LLRectBase< Type >::mBottom, mCancelBtn, mDescEditor, mFilename, mFilenameAndPath, mImageLabel, mImportList, mInventoryPath, LLRectBase< Type >::mLeft, mNameEditor, mObjectFile, mOKBtn, LLView::mRect, onBtnCancel(), onBtnOK(), LLLineEditor::prevalidatePrintableNotPipe(), recalcCost(), LLStringBase< char >::replaceChar(), LLStringBase< char >::replaceNonstandardASCII(), S32, LLScrollListCtrl::setAllowMultipleSelection(), LLUICtrl::setCallbackUserData(), LLScrollListCtrl::setCanSelect(), LLButton::setClickedCallback(), LLPanel::setDefaultBtn(), LLView::setEnabled(), LLLineEditor::setMaxTextLength(), LLLineEditor::setPrevalidate(), LLLineEditor::setText(), LLFloater::setTitle(), LLStringBase< char >::stripNonprintable(), LLView::translate(), LLStringBase< char >::trim(), and TRUE. Definition at line 362 of file llfloaterimport.cpp. Referenced by handleMouseDown(), and postBuild(). Definition at line 72 of file llfloaterimport.h. Definition at line 85 of file llfloaterimport.h. Definition at line 95 of file llfloaterimport.h. Definition at line 83 of file llfloaterimport.h. Referenced by onBtnOK(), and postBuild(). Definition at line 89 of file llfloaterimport.h. Referenced by LLFloaterImport(), and postBuild(). Definition at line 88 of file llfloaterimport.h. Referenced by LLFloaterImport(), onBtnOK(), and postBuild(). Definition at line 90 of file llfloaterimport.h. Definition at line 96 of file llfloaterimport.h. 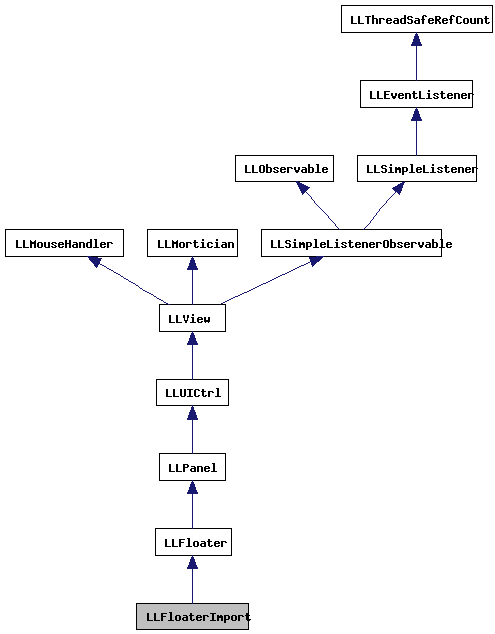 Referenced by draw(), handleMouseDown(), and ~LLFloaterImport(). Definition at line 86 of file llfloaterimport.h. Definition at line 98 of file llfloaterimport.h. Definition at line 81 of file llfloaterimport.h. Referenced by handleMouseDown(), onBtnOK(), and postBuild(). Definition at line 91 of file llfloaterimport.h. Definition at line 82 of file llfloaterimport.h. Definition at line 79 of file llfloaterimport.h. Definition at line 84 of file llfloaterimport.h. Definition at line 94 of file llfloaterimport.h. Referenced by handleMouseDown(), and LoadPreviewImage(). Definition at line 76 of file llfloaterimport.h. Definition at line 101 of file llfloaterimport.h.